1-2. Memorable Experience with Snow Activity! 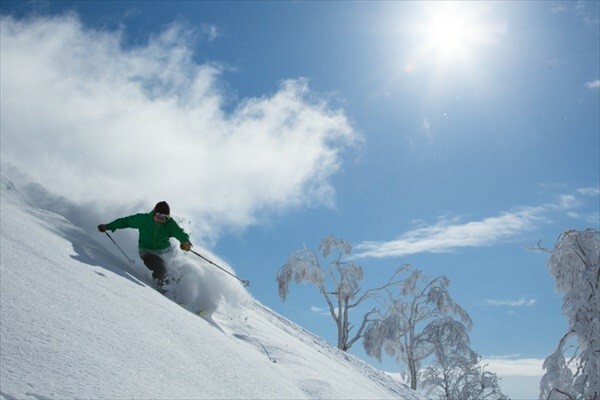 As on one of Niseko’s four largest mountains, Niseko Village Ski Slope features a course layout with the longest horizontal distance. The slope has enough incline to make it excellent for intermediate as well as advanced skiers. Especially for advanced skiers, we recommend trying the long run, which is an advanced course. There is a course with a particularly long ground run distance (5 km (3.1mi)) for an especially refreshing experience. There are a total of 27 courses: 13 beginners’ courses, 9 intermediate courses, and 5 advanced courses. Even those who have never skied before can come and have fun! 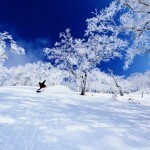 Now, the beauty of Niseko is of course its quality of snow. The smoothness of the snow captivated so many skiers, that there are a growing number of skiers from around the world who regularly visit the resort. 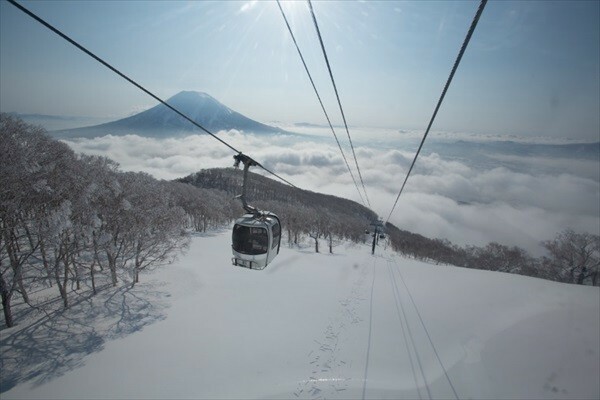 Niseko is in high altitude, and if you’re lucky, you might be able to climb to the summit while gazing at Mt. Yoteizan piercing through Unkai (sea-like layer of clouds). The sense of awe from seeing the grand scene of nature will stay in your memory for a lifetime. During the clear weather, the pure white and powdery snow contrasts with the vivid blue sky as shown in the picture to create a magnificent scenery. 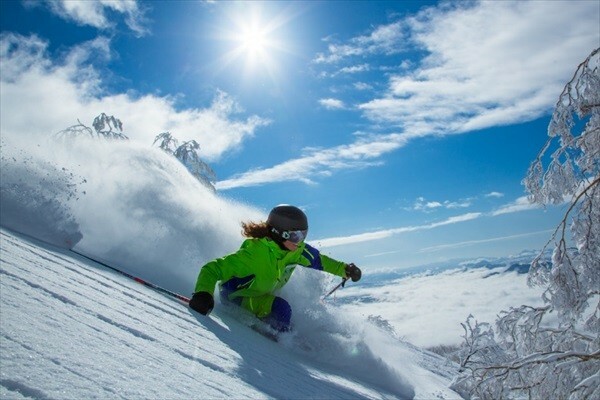 When skiing or snowboarding on moist, heavier snow, it’s often harder to speed up and carve. Contrarily, the snow here is especially smooth and dry, so you can slide down the slope effortlessly. What skiers and snowboarders want is the same: a slope with a smooth slide. 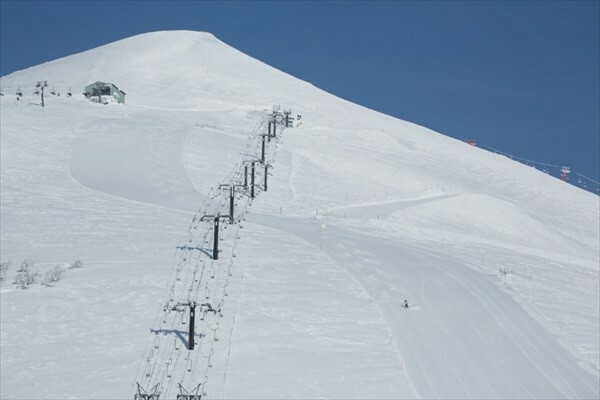 Satisfying all conditions, Niseko Village Ski Resort promises an amazingly smooth slide that will exceed your expectations. The secret to getting better at skiing and snowboarding is to do away with fear and hesitation. It’s all up to you: encourage yourself to overcome your fears! Once you jump into the graceful world of silver and white, you might experience the best glide you’ve ever had! 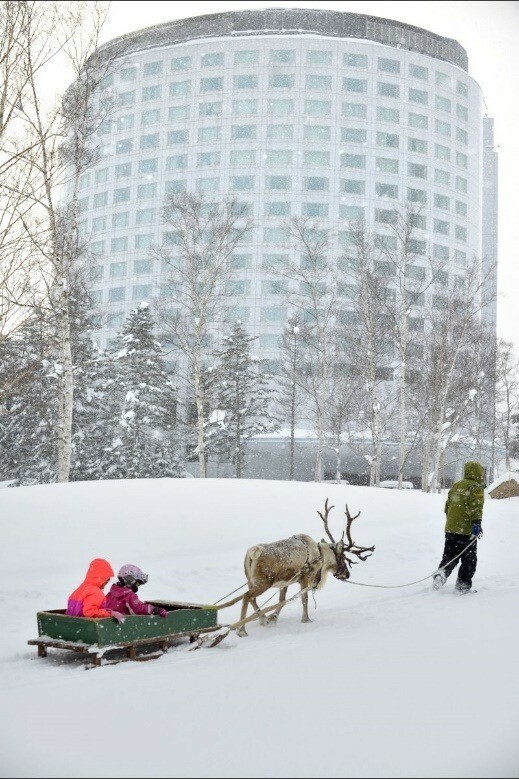 You can ride sleds pulled by reindeers, which is something children often dream about. It will make your children feel as though they’ve become Santa Clause. Riding a sled pulled by a reindeer is a pretty rare experience. Come and take part in the magical experience! Horseback riding can be done throughout the year, strolling through the snowy hills is rally precious! Why not get on horseback, which is also popular among children, and slowly ride through the grand scene of nature? Please be sure to wear extra warm clothes before riding. Around Niseko Village, even flat plains make for an incredibly beautiful scenery. You can traverse the beautiful snowy plains by joining snowshoe tours. Wear the walking equipment called shoe shoes and embark on a trip through the majestic snowy hills! Come and witness the magnificent scenery that can be seen here only. ※Snowshoe, Snow boots and Pool rental fees are included. Reservation Time：if you want to join the tour before 10:00 am, you should reserve till 17:00 the day before. 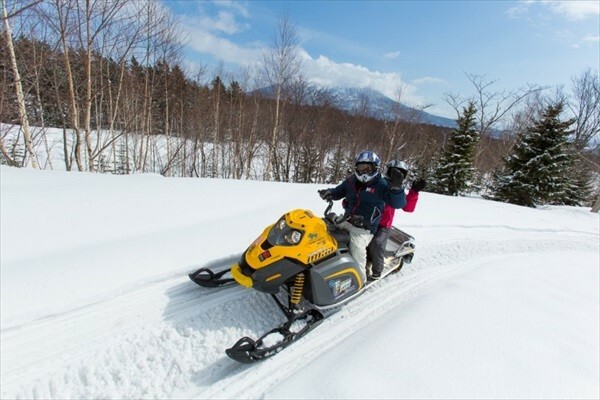 Snow mobiles are the motorcycle equivalent in snowy mountains. They are mostly used as patrolling and rescuing. If you’re interested, here you can try riding on a snow mobile. ※You can join this activity of you reach the controller handle by your arm reach. 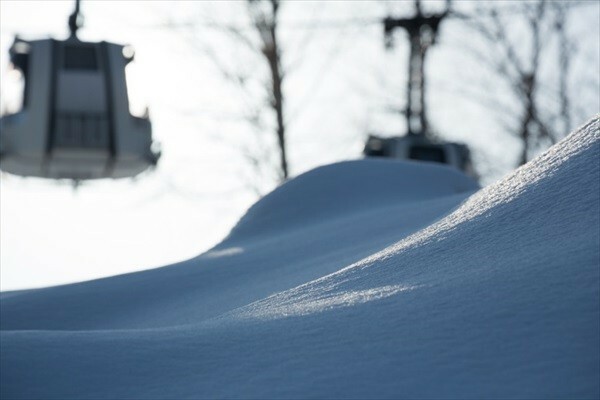 Here, once the sun comes up, you can go to the snow-cat and enjoy the fresh snow. Wouldn’t you like to go through the shiny snow to see the best kind of snow? Now, the tour can accommodate up to 6 people and those who are older than 13 years old only. If you’re interested, it’s better to reserve your place sooner. You can reserve the whole ride as well. The shopping and dining area is a composite facility opened in winter 2014. Popular for its unique Japanese atmosphere, the facility was made with a concept to look like a traditional Japanese village. With so many things to enjoy besides skiing, the resort is crowded with people every day. Inside the facility are a total of 7 businesses, including shops that sell designer goods and novelty items, and restaurants. 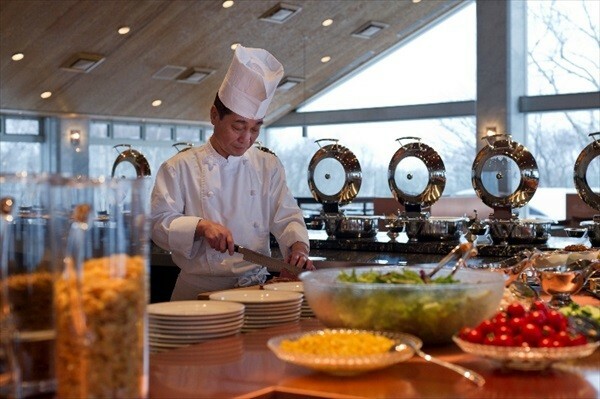 The food options range from a variety of sweets that can be enjoyed in an open terrace cafe, to Southeastern cuisine made by cooks from Thailand, Malaysia, and Singapore, as well as traditional Hokkaido food and seafood. How about visiting this newly-built snow resort that’s hot among tourists? 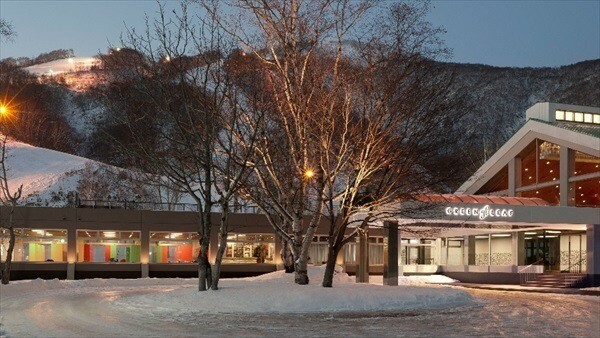 “The Green Leaf Niseko Village” is a hotel with an excellent location, situated right in front of the ski slope. There are plenty of convenient features for skiing, so you can go skiing any time. Also, in front of the hotel is a bus stop for the “Hokkaido Resort Liner,” which makes the hotel easily accessible from New Chitose Airport. Once inside the hotel, you can warm yourself in front of the hotel’s fireplace while enjoying the snowy scenery outside the hotel’s window. The hotel has excellent service and facilities compared to its rates. Please come and spend a luxurious time. The baths use water drawn from the hot spring source. There is also a spa available. The white birch trees surrounding the bath create an impressive snowy scenery during the winter. The path leading to the outdoor bath from the inner bathing area is constantly sprayed with hot water to keep it from freezing and becoming slippery. The buffet-style restaurant has a refreshing and pleasant atmosphere. There is a wide variety of tasty dishes starting from the morning, which are made by chef’s right in front of the guests. The various Japanese, European, and Chinese-style menus change daily. 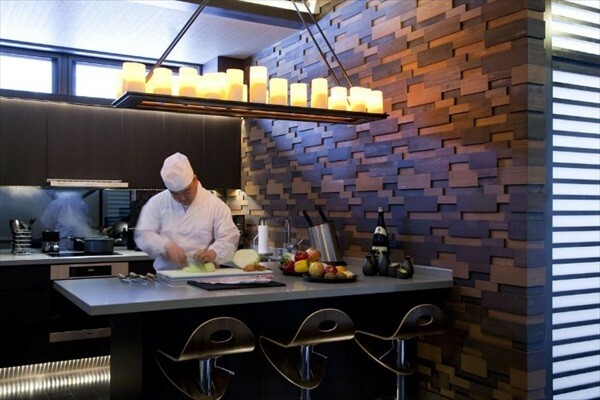 There are also many dishes that can be enjoyed as they are made fresh. Satisfaction is guaranteed. You can also find a wide range of salads and fresh fruits that can be enjoyed as much as you want! 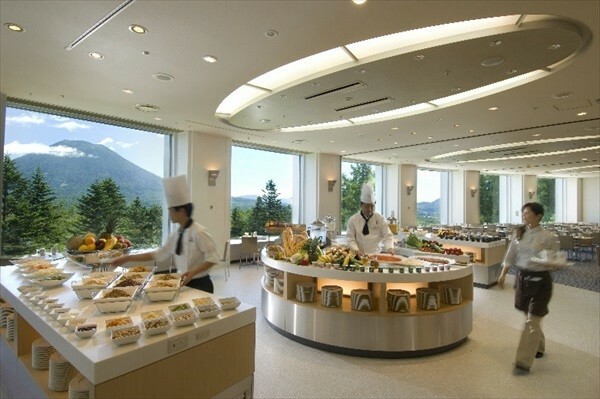 The Green Leaf Niseko Village has an awesome location, outstanding service and facilities, as well as delicious foods, all provided at reasonable rates. Please try out this excellent hotel. 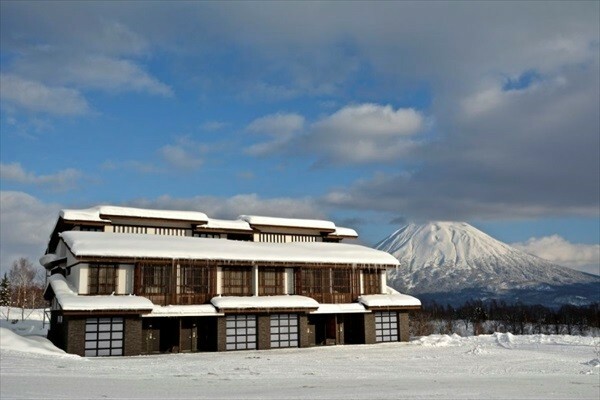 “Kasara Niseko Village” is located in the center of Niseko Village. Featuring 8 townhouses with 3 bedrooms each, it lets you experience a lifestyle in the middle of nature. It’s also an excellent choice for serious skiers, as it provides convenient access to the ski slope. 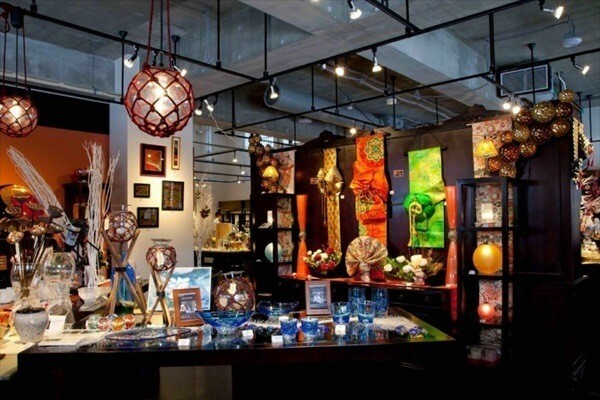 One of the biggest characteristics of Kasara is that its interior was mostly done by a famous interior designer. 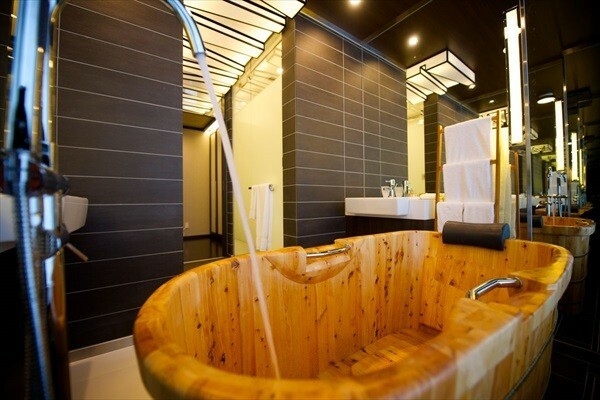 For example, this wooden bath tub brings out the charms of Japanese design to the fullest extent. The townhouses also have cooking utensils for extended stays, a pleasant addition for guests who’d like to cook for themselves. Moreover, the facility provides private concierge services and special amenities to meet your requests for a more pleasant stay. The townhouses come with all the appliances necessary for living. Please use the facility as your second home! 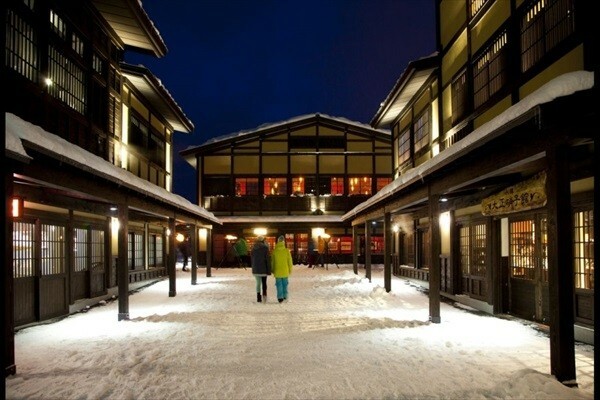 The world-famous hotelier Hilton runs a hotel business in Niseko. 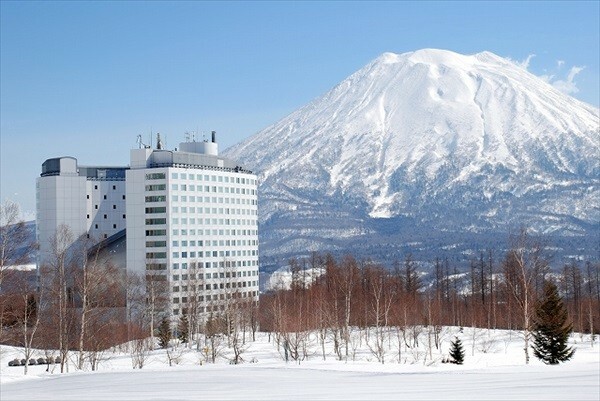 “Hilton Niseko Village” provides great access to the ski slope, as well as spaces and amenities for children’s enjoyment. For those interested in various activities, we recommend Hilton. 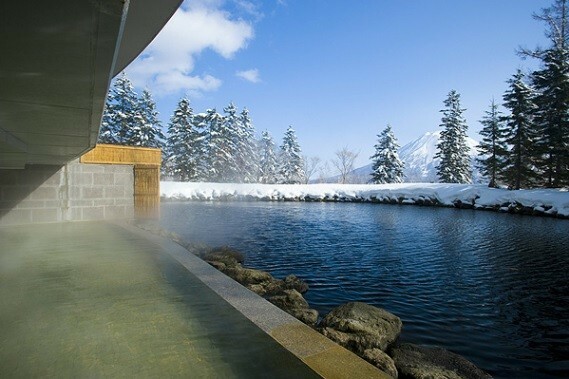 The hot spring uses water drawn from the source, packed with the grace of Niseko. The outdoor hot spring is situated next to a large pond, which makes for an excellent scenery. 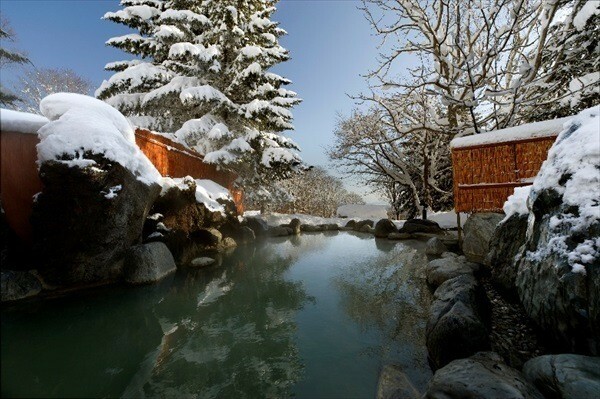 Especially known for its effectiveness in relieving fatigue, the hot spring is great for skiers feeling winded from skiing. The hot spring is also spacious, making for a pleasant experience. 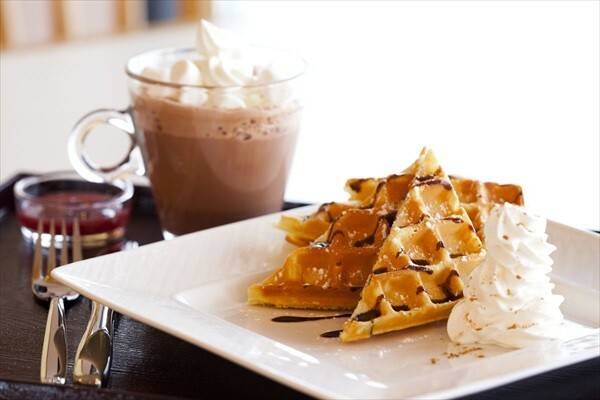 Come and spend a moment of bliss while enjoying the exquisite snowy scenery. There is a wide variety of menus to choose from. They taste great, too. Enjoy your delicious meal while gazing at the beautiful Mt. Yoteizan through the hotel’s large window. Spend a slow, relaxed time at the hotel that will make you forget about the hustle and bustle of everyday life. The luxuries of traveling are in the food and hot springs. 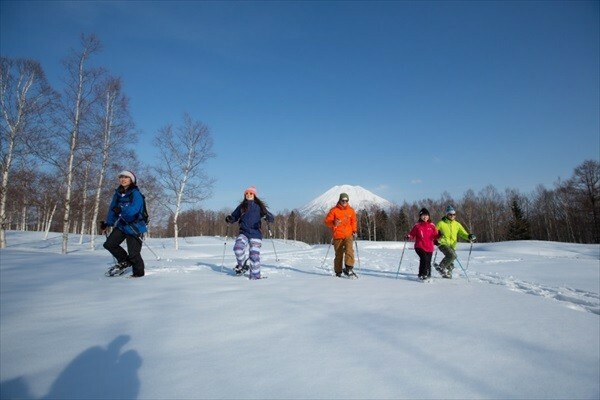 Have all the fun you want at the ski slope and enjoy Niseko’s winter to the fullest. 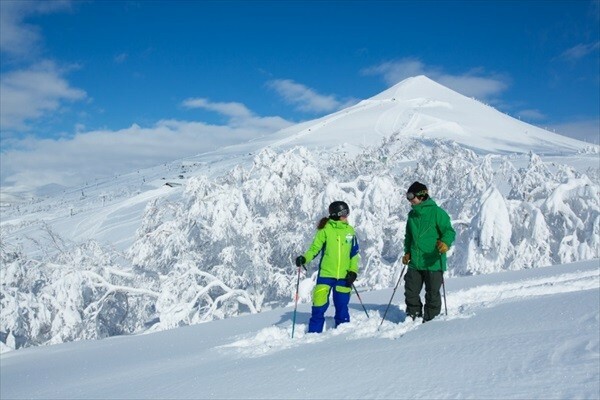 You can use the United Shuttle which is from New-Chitose Airport to Niseko. 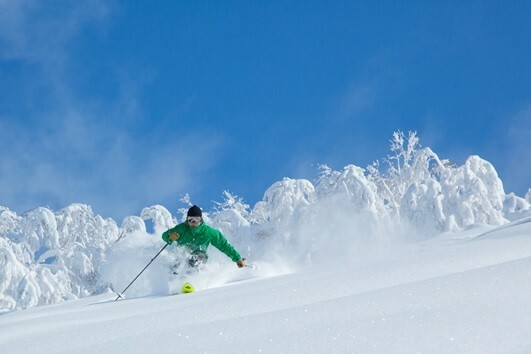 As a place that has numerous slopes for fun skiing and snowboarding, as well as large resort hotels, Niseko Village Ski Resort is full of fun activities you can look forward to. 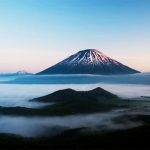 Starting with powdery “aspirin snow,” a rarity in Japan, you can enjoy the magnificent scenery as well as exquisite cuisine at the same time. 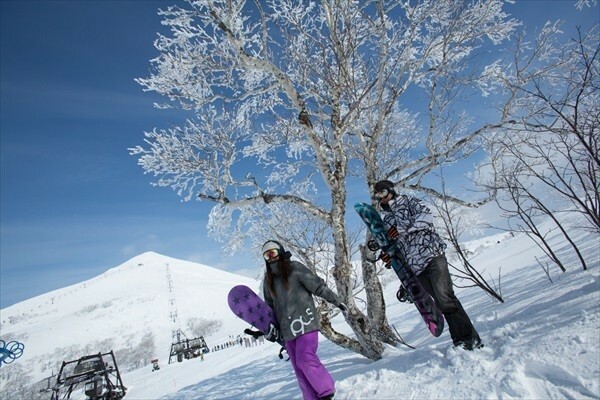 We invite you to Niseko, a holy place among skiers, to make truly memorable moments.